Sleep apnea is a common disorder affecting millions of Americans today. If you have been diagnosed with this condition, we can provide you with an alternative solution that helps you sleep soundly at night. The most common type of sleep apnea is called obstructive sleep apnea. This condition is caused when the airway collapses or is briefly obstructed during sleep, resulting in a sharp intake of air and a loud snoring sound. If you experience any combination of the symptoms above, we recommend seeing a sleep specialist to determine if you have sleep apnea. How can Hassey Do Duy Help With Sleep Apnea? Traditionally, patients had to rely on cumbersome CPAP machines to overcome sleep apnea. But not any more! Today, dentists offer a revolutionary treatment to help patients manage their sleep apnea! We replace clunky, bulky, embarrassing CPAP machines used to curb snoring and sleep apnea with a discreet, comfortable custom mouthguard. The wearable appliance moves the jaw forward, creating more space between your tongue and soft palette. 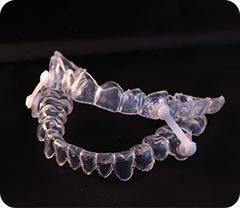 The adjustment helps curb airway obstruction and prevents snoring. That means a more restful night of sleep for you. If you have been diagnosed with sleep apnea, we would to tell you how we can help you get a healthy, restful night’s sleep. Call our office today to set up an appointment to discuss our sleep apnea solutions!